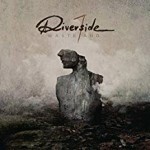 Share the post "Album review: RIVERSIDE – Wasteland"
The death of Riverside guitarist Piotr Grudzinski in 2016 hit the band really hard. Not only was he one of a ‘band of brothers’ and an exceptional guitarist, he was part of a band that were on the cusp of great things. There was talk of the band folding, but, following an intense period of grieving and introspection, they made the difficult decision to continue as a three-piece – and we should all give thanks that they did. For not only is ‘Wasteland’ up there with LFATTM it is, in some respects, even better as it has been created by drawing on real-life experience, grief and even a little anger with the unfairness of it all. Be warned though, this is not an easy listen as the band takes us through both their own darkness and their visions of a dystopian future for the planet. Things get underway quietly enough with the a cappella ‘The Day After’ but the swelling keys have a sinister tone – a harbinger of what’s to come as the pounding metal riff of ‘Acid Rain’ kicks in. This sounds as you would expect a track called ‘Acid Rain’ to sound, but, and Riverside do this particularly well, it then segues into a to-die-for anthemic chorus, thence into a contemplative middle section adorned with almost angelic voices. Just brilliant. This continues with ‘Vale Of Tears’ – its metallic attack being soothed by a folky chorus, and ‘Lament’, whose acoustic arpeggios sound very like (main man Mariusz Duda’s side project) Lunatic Soul before a classic Riverside metal riff kicks in. You really can’t take your eyes off this for a minute. And this is true throughout the whole album – just when you think you know which way a track is headed, they bring you up short and deliver the unexpected. This is especially true of ‘River Down Below’ whose insistent acoustic riff worms its way into your subconscious before being resolved by a tight electric solo, and the title track with its almost Jethro Tull acoustic beginning, ooh-ah vocals tied in with expressive electric guitar which are then blown away by more metallic rifferama. Elsewhere, ‘Guardian Angel’s’ hushed vocals and ‘The Struggle For Survival’s opportunity to play “Spot The Riff” with its nods to Zeppelin, Sabbath and particularly King Crimson are both highlights as is piano-led closer ‘The Night Before’ – a lovely way to end. Make no mistake – this is progressive rock at its absolute zenith. Mariusz Duda has taken on guitar duties superbly (with outside help for the solos), the keyboard work of Michal Lapaj has assumed a greater importance and the drumming of Piotr Kozieradzki is peerless – all of which coalesce to make ‘Wasteland’ the triumph it is. I think if Piotr Grudzinski is looking down from above he would be both pleased and proud, in equal measure, with the way it’s turned out. This entry was posted in ALBUM REVIEWS, ALBUM REVIEWS (Mobile), All Posts and tagged album, Mariusz Duda, Progressive Rock, review, RIVERSIDE, Wasteland. Bookmark the permalink.